Murtho Forest and Heading Cliffs located just 15km north from Paringa and are well worth exploring. Murtho Forest Landing has a parking area and a place for launching boats. It is surrounded by gum trees and willows and is peaceful and attractive. There is also an excellent view from Heading Cliffs, on the way to Murtho Landing, which is recognised as one of the finest vantage points on the shores of the river around this section. It offers excellent views of the cliffs on the Murray River from the lookout tower. To reach this lookout tower travel 15 Kilometres from Paringa on the Murtho Road. This image belongs to the travel and nature stock photo library. This stock photo of Murray River Near Heading's Cliff is available for licensing for commercial and editorial uses including websites, blogs, books, magazines, brochures and advertising. Restrictions may apply for images which contain third party copyrighted material or sensitive subjects. Photos of artwork are for editorial use only. 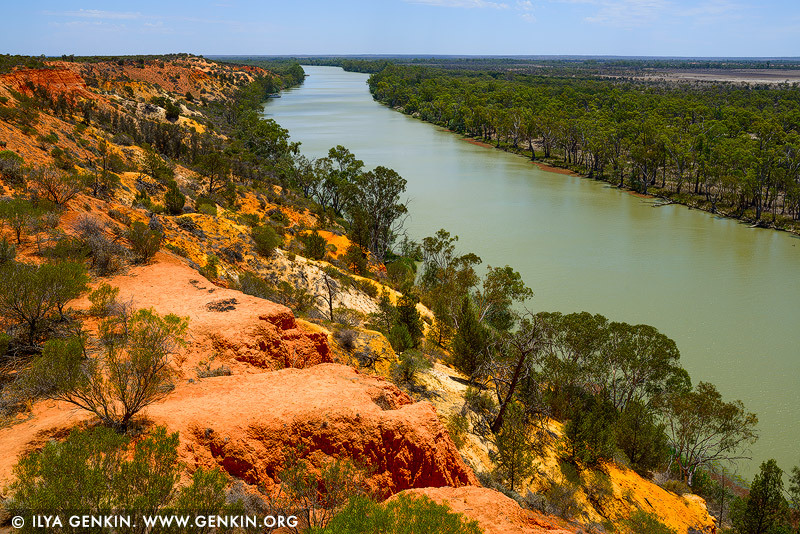 This image id AU-MURRAY-RIVER-0005 of Murray River Near Heading's Cliff, is copyrighted © by Ilya Genkin. This is not a public domain image.